The J.M. 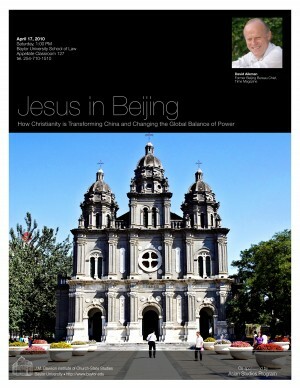 Dawson Institute of Church-State Studies invites you to a lecture entitled "Jesus in Beijing: How Christianity is Transforming China and Changing the Global Balance of Power" by David Aikman, former Beijing bureau chief, Time Magazine. The lecture, co-sponosored by the Asian Studies Program, will be Saturday, April 17, 2010 at 1:00 PM. It will be held at the Baylor University School of Law, Appellate Classroom 127.